Before we at the walkscotland.com editorial team set off on our Coast to Coast in a Day challenge, we managed to get our hands on some clothing from Britain's biggest outdoor brand, Regatta. They supplied us with superb windproof Proton fleece jackets and waterproof Dryline walking trousers. As it turned out, we spent our day in perfect conditions for testing such garments - wind and fairly constant rain. A typical autumn day in Scotland! 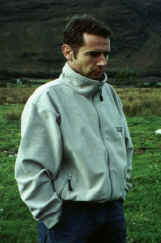 The Proton jacket is part of Regatta's popular X-ert range. It features the company's Deflector technology which creates a windproof jacket by sandwiching a breathable PU film between the layers of fabric. The Proton is also water resistant, which means it will stand up to a shower rather than a complete drenching and it features a full length zip with an easy to grab extended toggled, two zipped lower pockets, two inner pockets and an adjustable shockcord hem. The cuffs are elasticated. The Dryline trousers, which are new for autumn/winter 2000, look like ordinary walking trousers. However, they are made from soft Isotex fabric, making them waterproof and breathable. There's a comfortable lining within and they come with a belt with quick release buckle and four pockets - the leg one is zip closed with a Velcro flap and the back pocket has a Velcro secured flap. Colin I found the Proton to be an extremely comfortable and well-cut jacket. The design allowed free movement of the arms and the neck came up far enough to keep the wind out, but didn't restrict the face in any way. The fabric has a pleasant, soft feel to it and it performed extremely well. Prior to the coast-to-coast trek I wore it on a couple of occasions while walking the dog on the local beach. It coped very well with some perishingly stiff sea winds and throughout the trek itself I was kept very warm. When not in use, the Proton packed away into a reasonably small, lightweight bundle. The elasticated cord tog on the main zip was a handy feature, especially when wearing gloves. This is a great product, demonstrating that Regatta is a serious player in the outdoor market, and one I would certainly recommend. The Dryline trousers fitted very well. There was space to move within them without them being baggy and they are extremely light to wear. The lining makes them very comfortable and they could be used either by themselves in warm conditions, or in cold weather, over thermal leggings. They proved to be 100% waterproof and dried very quickly. Back home a cool wash in the machine cleaned them up with no loss of performance on their next trip out. Certainly something I will be wearing again and again on my outdoor excursions. Andy The Dryline trousers proved excellent throughout our extraordinary test. They were light, very comfy and managed to keep out the rain which afflicted us for most of our 14-hour hike. The cut is good and the handy buckle arrangement means that you can adjust them to suit when you are wearing extra layers underneath. They washed easily and dried out quickly too. The fleece was also excellent, keeping out the wind to a good degree. I wore the fleece with just a vest underneath and managed to keep a reasonably comfortable temperature throughout the coast-to-coast walk. The fleece also has water repellent qualities but the sleeves did get a little damp inside if exposed to anything more than light drizzle. Chris The Proton is a stylish jacket and its close-fitting cut means it doesn't hang about the hips. But neither does it restrict arm and shoulder movement. Its combination of well thought out design and light-weight fabric provides the wearer with freedom of movement. For the coast-to-coast walk I took with me Dryline trousers, a T-shirt, cotton jumper and an over-jacket. Despite near-constant rain, albeit seldom torrential, I only had the over-jacket on once and the jumper remained in the rucksack. The windproofing qualities of the fleece helped keep a fairly even body temperature and the absence of an over-jacket helped relieved that heavy, oppressive feeling that comes with trudging through rain. I make no claims that the fleece is waterproof but during intermittent showers it did exactly what it says on the label. This leads me to the conclusion that in all but the fiercest of weather you can make do with Regatta's new fleece and perhaps a light over-jacket. Regatta's Dryline trousers are simple and comfortable, no heavy cloth and bulky zips in sight, just well-cut Isotex with a delightfully soft lining. In 33 rainy miles across Scotland never once did I feel uncomfortable. The Dryline trousers really are waterproof and they also keep you warm, while letting out perspiration. There quick-release belt buckle is handy when you have chilly fingers. It is very difficult to raise a murmur against these two products from the Regatta wardrobe. They perform well, are comfortable, fit nicely and look good. Expect to see a lot of them on the mountains in the months to come. Regatta Proton: Price: £56. Sizes: S-XXL. Colours: mushroom, navy or deep red. Dryline Trousers: Price: £38. Sizes: S-XXL (men's) and 10-18 (women's). Colours: dark beige or navy.